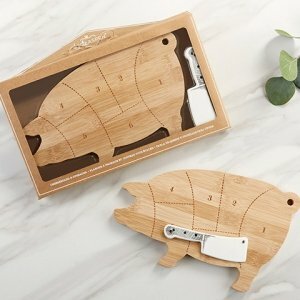 Kate Aspen's Farmhouse Pig Cheeseboard Gift Set is the perfect serving piece for a charcuterie, cheese appetizers and other small bites at your wedding, bridal shower or engagement party. 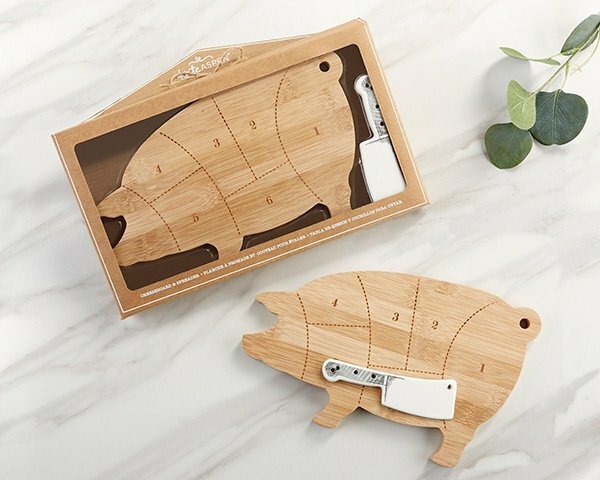 Shaped like a pig, this cheeseboard features a butcher chart and comes with a coordinating white ceramic spreader designed to look like a miniature cleaver. Guests will love taking home this unique, creative cheeseboard and spreader set. NOTE: Closeout item. Minimum of 6 required for purchase. Is the 6.18 the length of the cheeseboard? The 6.18" is the height of the cheeseboard. The cheeseboard measures 10.23"w x 6.18"h x 0.59"d and the spreader measures 4.72"w x 1.41"h x 0.11"d.